This packet sows up to 30 feet. While colored carrots seem to be new to home gardens, they have been around for centuries. In fact, the purple carrot has been around for at least 1,000 years. After losing out to the more popular orange carrots long ago, purple carrots have been rediscovered. Kids will love them as a colorful snack. Besides being high in vitamin A, purple carrots contain anthocyanin (an antioxidant). 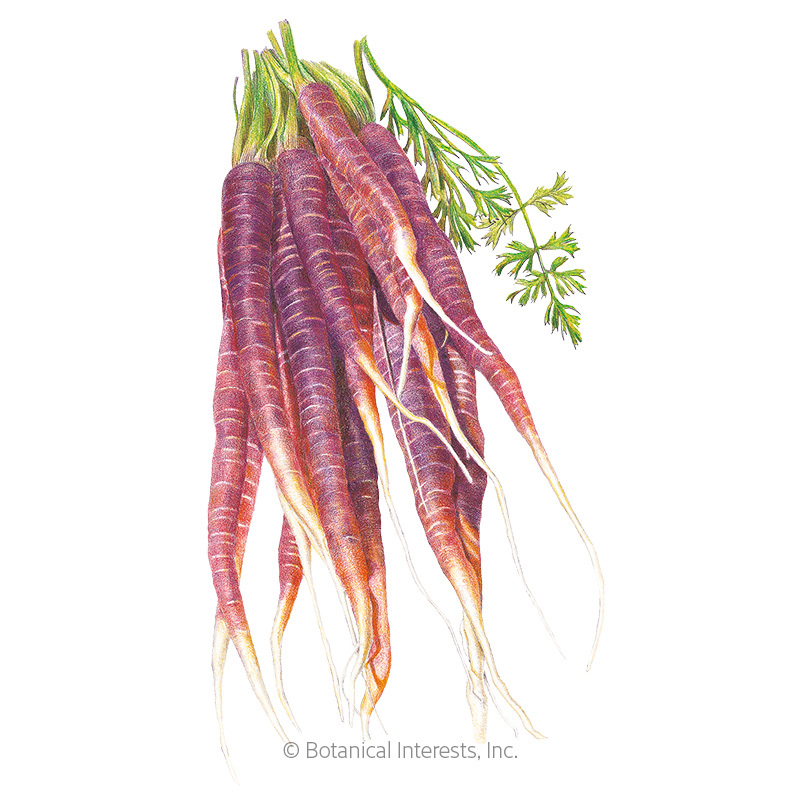 Variety Information: Conical roots with long tapered ends, purple skin with orange interior. 'Cosmic Purple' has characteristics of both imperator and nantes types carrots. When to Sow Outside: RECOMMENDED. 2 to 4 weeks before your average last frost date, and when soil temperature is at least 45°F, ideally 60°–85°F. Successive Sowings: Every 3 weeks until 10 to 12 weeks before your average first fall frost date. In very warm climates, carrots are grown primarily in fall, winter, and spring. Thinning: When 1" tall, thin to 1 every 3"
Harvesting: For best flavor and texture, harvest carrots any time before, and until they reach their optimal size. Peak harvest period lasts about 3 weeks, longer in the fall. Late summer-sown carrots are sweetened after having been kissed by light frost; however, harvest before soil freezes, which may destroy the crop. In USDA zone 5 or warmer, carrots can be left in the ground for storage provided they are heavily mulched; harvest as needed on days the ground is not frozen.